Many thanks to Merlins magic wand, who kindly granted Hope 30 free tickets for a trip to Alton Towers in Summer 2011. Hope subsidised this respite trip and funded a further 19 places and the coach to Alton Towers. 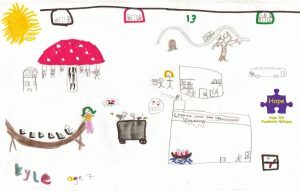 Picture below drawn by Kyle Smith, aged 7 years and from Hyde and shows what fun he had on the rides that day. All the families who attended had a fabulous time and the team at Alton Towers were just fantastic and could not do enough for our children.